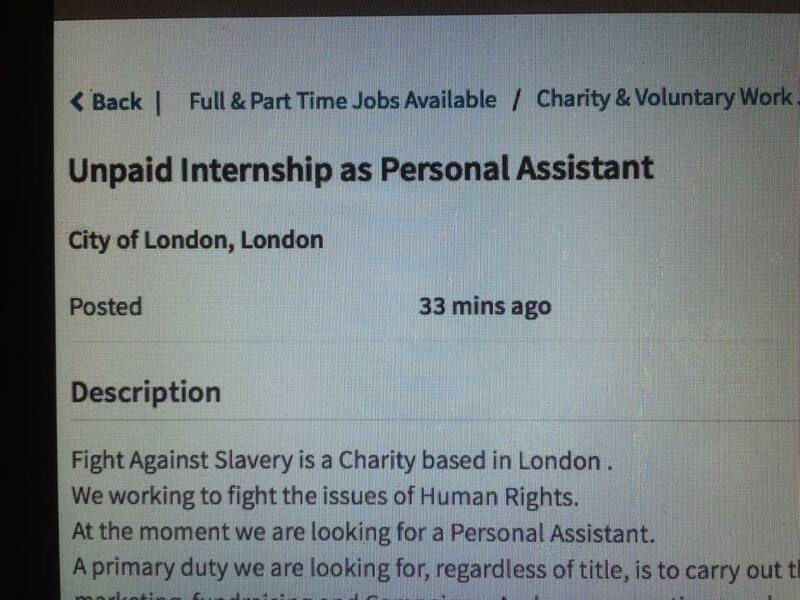 Okay, an unpaid internship isn’t exactly slavery as the person in the post has to apply for it, rather than simply being sold into it. But it’s still work for no pay, and questions should be asked about the validity of an organisation that offers such work as part of its fight against similar work. Many Tory MPs used to offer unpaid internships. This Writer always used to wonder if it was a way of ensuring that only the most privileged people – those who could rely on mummy and daddy to pay their bills – were able to take the job, thereby ensuring that the work of government remained the province of the elite. I wonder how many Tories continue to offer internships on that basis. For that matter, how many other MPs do so? I have just had a look at the ‘Fight Against Slavery’ web site. Interesting – in the fact it is full of what it hopes/wishes to do in various parts of the world. However, wouldn’t a charity mention it’s successful or current projects? Employs staff in Latin America, Asia and the UK. Strangely I couldn’t find any mention of asking for money only for volunteers.